Hello, Gorgeous! : Stella & Dot Giveaway!! I would wear this bracelet with everything!!! I have been loving it for a while and have been contemplating buying it!! Love the bracelet. It would dress up any outfit! OMG literally perfect! Ive been eyeing yours in all of your OOTD! I have been wanting a cuff like this! I would wear it with casual and dressier outfits! Just found your blog yesterday. Love it!!! Thanks for the fun giveaway. I must have this, very Katniss from The Hunger Games! I would pair it with anything from jeans and a cute tee to a skirt and heels. Oslo Necklace or the Madeline Pearl Necklace! And agree about the bracelet being very Katniss! I need it for the Catching Fire premiere. I'd pair this with my rose gold watch. Best giveaway!!! I love that bracelet! I LOVE this bracelet and have wanted it ever since I discovered your blog about 3 weeks ago. The first thing I would wear with this bracelet is my brand new suit for my brand new job I started this week! I just graduated college and started my career! This bracelet will match everything so the easier question is what wouldn't I wear this with?! I've been eyeballing this bracelet forever!! I'd wear my mint chiffon tank, skinnies and black/gold Tory Burch flats! I'd wear it with a tank, cutoffs and a chunky ring! I love this bracelet, pretty sure I would wear it every day. Hope I win!!! I would wear this all the time! It would look cute with all off my gold shoes! I LOVE Stella and Dot! I am becoming obsessed with Stella and Dot and this bracelet would go perfectly with a watch and any outfit. It's practical and a great 'every day' piece! 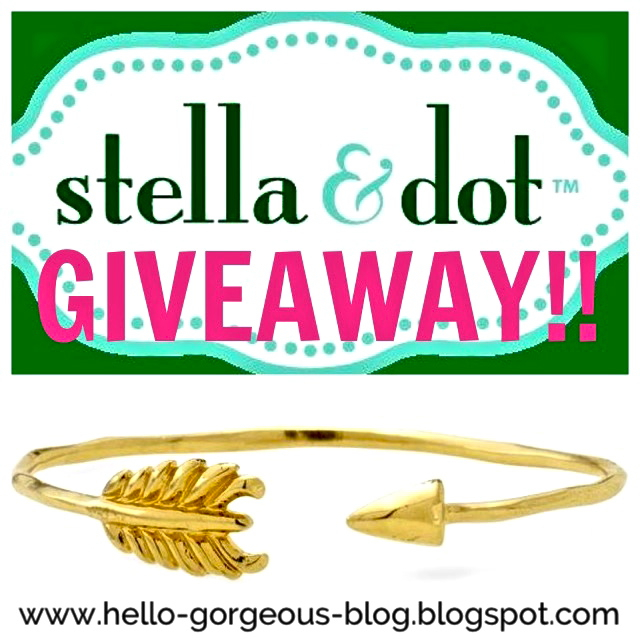 I already have a collection of gold bracelets I wear everyday, this gorgeous arrow is just begging to join them! Love this one!! I would pair it with a simple grey T and jeans - just the right amount of sparkle! I'd wear this with anything, but it would be perfect for my outfit today-- taupe sheer top with black skinnies and leopard print pumps! I just have to tell you that your blog is my new obsession! I LOVE it and you've inspired me to revamp my own wardrobe with great staple pieces and chic accessories--like this arrow bracelet! You have a great fashion sense and I hope my outfits can be as chic as yours someday! I love all things stella and dot!! I'd wear this bracelet with everything! Thank you for the beautiful & flirty giveaway! Love, love, love Stella & Dot! Love this bracelet. I would wear it with anything. It's that perfect! Love love this bracelet! I would pair it with jeans and a nice top with my big gold watch or even a nice sheath dress and pumps! I have a number of slinky dresses that this bracelet would look great with! I'd stack it with coordinating bangles . . . add a belted top, skinny jeans and a pair of riding boots. But, you can wear it with just about anything! I LOVE this giveaway! Thanks for the opportunity to win! I would pair this with my gold and aqua bracelet from chloe & isabel! I'd pair this pretty with a blazer, boots and jeans - I'm so ready for fall!! This would be my cute go-to bracelet for sure...perfect for every outfit. As a mom of two, it would be my small piece of bling for my days. When you started posting outfits with the bracelet, I was really trying to figure out when I was going to buy it! Thanks for the giveaway! I am always looking at your blog! I would wear this bracelet on an everyday basis to the office! I would stack this with my favorite JCrew Factory mini pave link bracelet! So cute, thanks for hosting the giveaway!! Honestly....I would pair it with just about everything I wear to the office. Love it! I'd wear it with my Michael Kors boyfriend watch and my Stella & Dot Renegade bracelet... EVERYDAY! LOVE Stella and Dot!! Gorgeous!! I ADORE this bracelet! It is the perfect accessory to add a little edge to any outfit. I am a huge proponent of taking a very feminine look and adding a little edge to it; this bracelet would definitely do the trick. Thank you so much for offering this incredible giveaway! I certainly hope that I win because I need to give my beloved bubble necklaces a break! This bracelet would go with all my gold jewelry and accessories... Love the look! Thanks for offering this giveaway! OMG what a pretty Bracelets. I really love your blog.